Collect more data by asking your sales reps a set of pre-defined questions during calls. 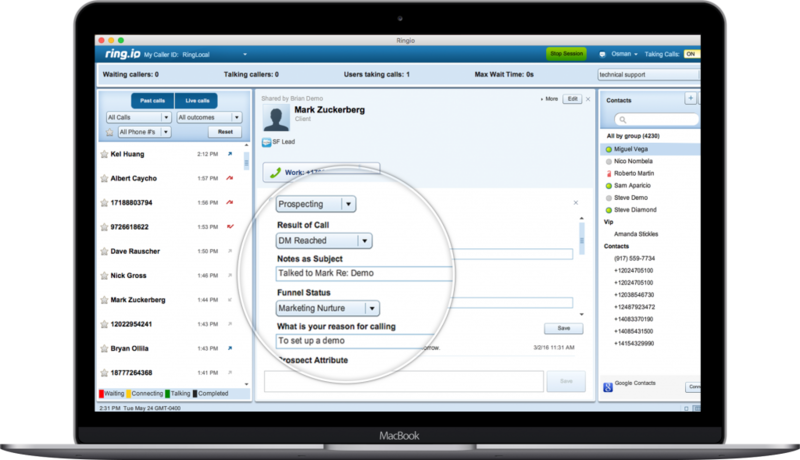 Ring.io’s call dispositions boost sales productivity by automatically updating Salesforce fields. Simply choose which fields you want to show in the call questionnaire and those fields will be updated after each call. Ring.io can update any field, including fields on custom objects. Update lead qualification fields while on a call. Pull relevant information abut the call from Salesforce. Update task, lead, and account fields all from one screen. Every minute that your team spends logging data to Salesforce is time spent not selling. With Ring.io's call disposition for Salesforce, sales reps have all of the fields they need to update in front of them during the call, so they do not have to go searching for them. With call dispositions for Salesforce, sales teams can collect more data from each call so they have a complete view of their sales process. You can create multiple questionnaires that each have as many Salesforce fields as you want.